I make this dish year round, because who doesn’t want a quick, weeknight, one-skillet super dish! But I think it’s especially nice for Fall when the weather begins to cool down. The sweet potatoes, bacon, and kielbasa fill you right up, while the edamame and corn add some colorful nutrients. Make it With Bacon… Or Not. 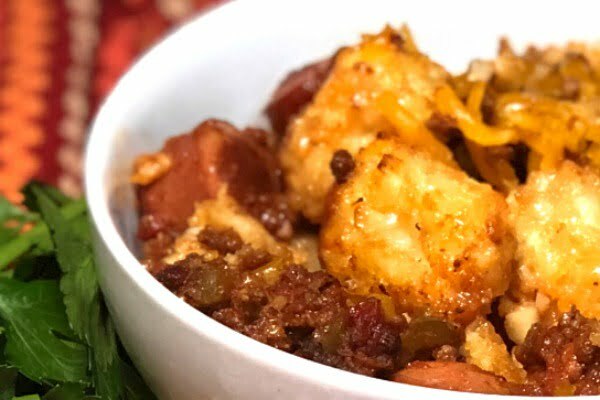 If you prefer your Crispy Bacon and Sweet Potato Hash to be vegetarian, it can easily be done just by eliminating the bacon and kielbasa, but my guys would NEVER go for such a thing….they would pitch a total fit! I have added quinoa or kaniwa to this dish before. It stretches each serving a bit farther and adds an extra protein element that fills you right up. Crispy Bacon and a whole lot of happy people! 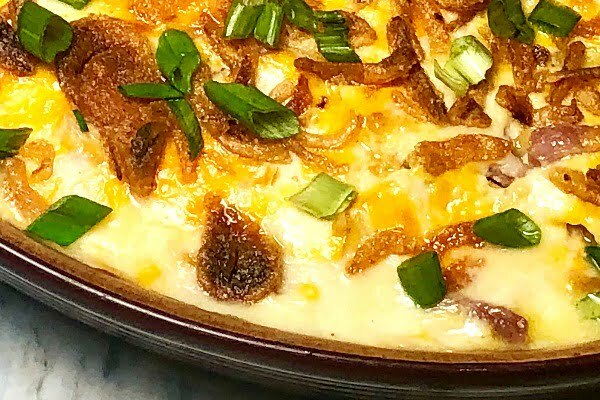 I had so much fun sharing this recipe in Atchison, Kansas at our first “Let’s Get Cookin’ Atchison” class! Surrounded by home cooks eager to up their dinner game and feed their families, I get to do some of my favorite things: meet people, teach kitchen tips and recipes, and eat good food. If you’d like to know more about Chef Alli’s “Let’s Get Cookin'” class series, click on “About” in the menu, and Let’s Get YOU Cookin’! In a large heavy-bottomed skillet over medium heat, cook bacon until browned and crispy, then remove to paper towels to drain; reserve. Remove all but 1-2 Tbs. of bacon drippings from pan; add kielbasa coins browning them off on each side, then adding them to the reserved bacon. Add thyme, mustard, onion, bell pepper and sweet potatoes to the drippings in the skillet; sauté for a few minutes over medium high heat, stirring often, adding chicken broth to the skillet as needed to keep the ingredients moist and from sticking to the skillet bottom too much. Stir in the garlic, corn and edamame; cover skillet and continue to cook, stirring often, 12-15 minutes or until sweet potatoes are fork-tender. Stir in the reserved bacon and kielbasa; season to taste with salt and pepper. Serve at once. Potato, Kielbasa, and Sauerkraut Skillet!